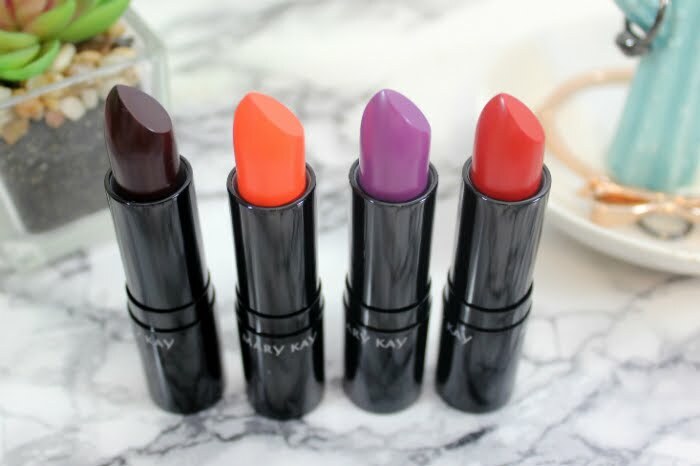 Mary Kay has launched some new limited edition matte lipsticks for the fall, the 'IT" lipstick collection. 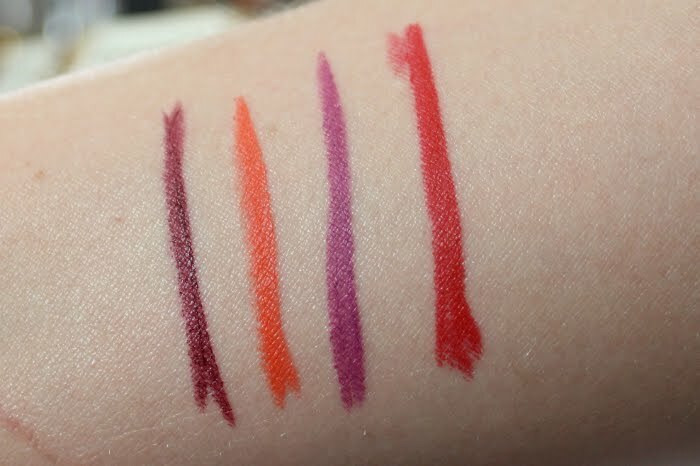 The collection consists of four bold matte shades and sell for $20 Canadian. 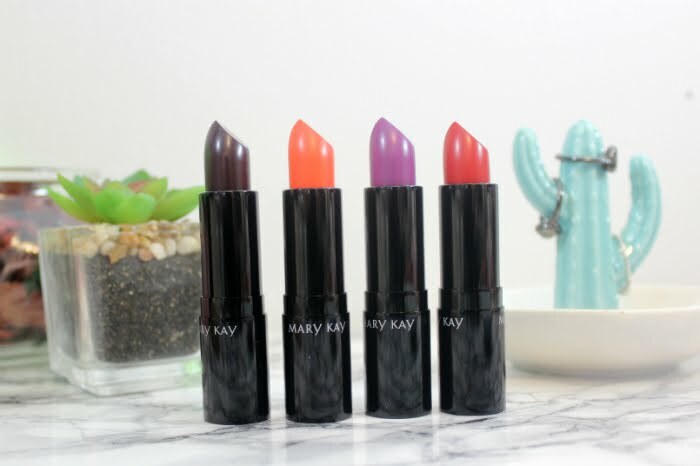 I honestly love Mary Kay's lipstick formula and was pretty excited for some new bold shades as well as a new matte formula. The formal varies a bit shade by shade, but overall they are a nice smooth finish and not drying (for a matte). I found that my lips are already dry right now (hey, welcome to fall, dry lips and skin season), they cling to the dry bits, but when I exfoliated beforehand they went on very nicely and smooth. 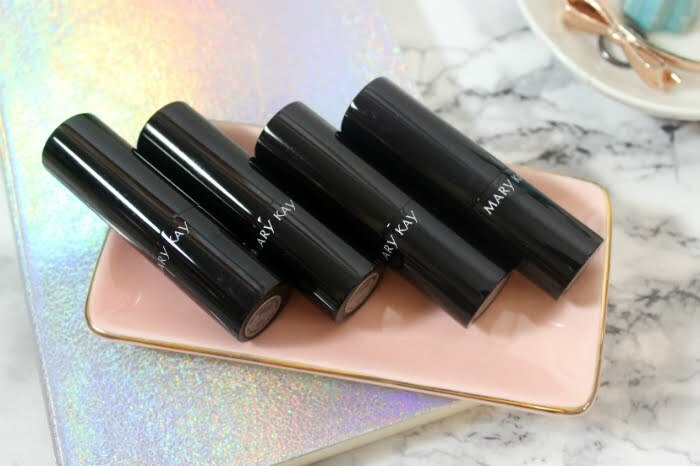 The tubes have a nice weight and quality feel to them, which I expect from Mary Kay, they always seem to add that nice detail of an expensive feeling tube to their lipsticks. This is a deep and dark purple that looks almost black in the tube. For those a bit squeamish about vampy or dark shades you will be happy to learn that this shade in no way goes on that dark. It sort of just looks like a deepened purple and it is by far the patchest of all of them on me. It also was a bit more sheer. I had to layer it up quite a bit to get this much pigment on my lips. All in all it is a nice deep-dark purple shade. This colour is my favourite shade of all of them. I love a bright orange and I honestly think it looks good on me. 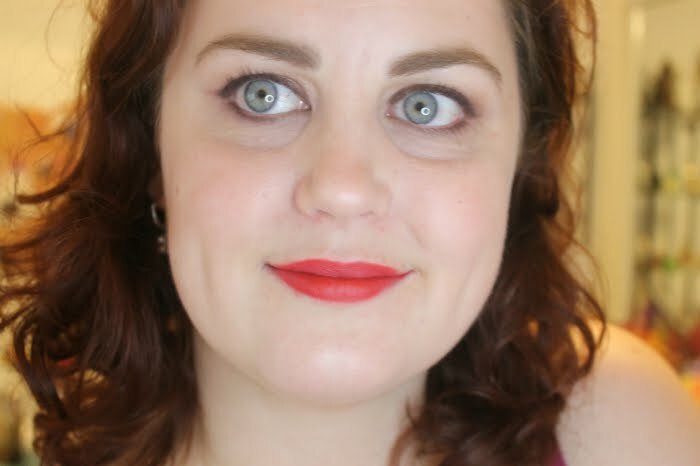 Sadly, my lips are dry this time of year and this shade sticks to my dry patches like mad, as I said before, a good lip scrubbing beforehand goes a long way to make this lipstick look better on the lips. I love that this is a bright orange for fall, not a burnt orange or a red-orange, but a seriously bright and lifted one. 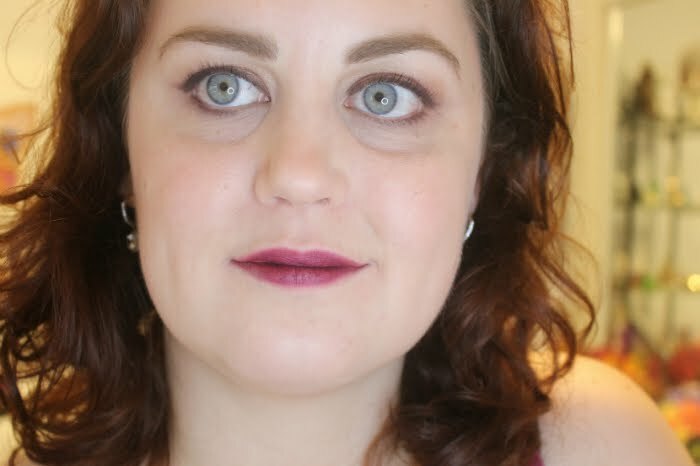 This one happens to be my type of purple, I find it looks good on me and I am a sucker for shades like it. Not too dark, not too light, just right. It happens to be a bit sheerer than the rest but still is matte and wears really well. I have been wearing it all week and getting lots of compliments. It really feels nice on the lips too. This is a great true red shade, but brighter. It is strange to describe. It is bright but not light or muted in colour, just a very vivid red. 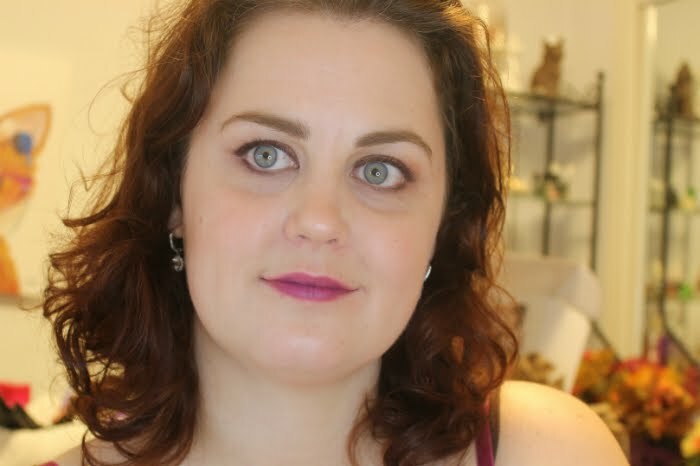 I feel works really well on my skin tone and could work well on a lot of other peoples too. A good true red is a great thing and I honestly think this one is one for sure because it isn't too dark. 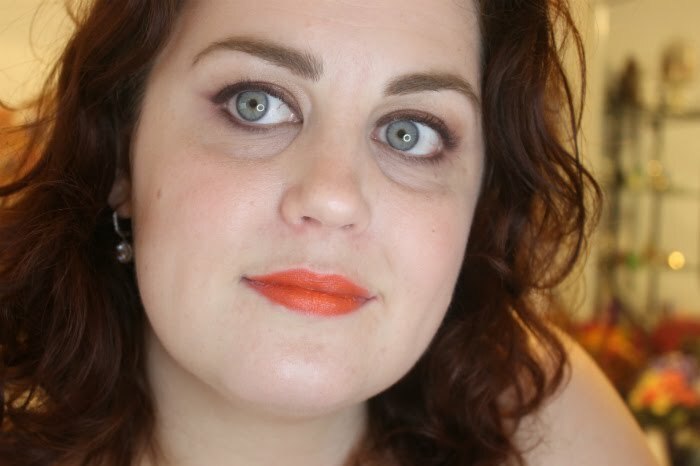 It has by far the smoothest consistency of all of the lipsticks. Overall I like these shades, they are bright, bold, and fun! I wish the formula was a bit more consistent between the shades but all in all it is a great limited edition collection. In an additional note, I read Rachelle's review over at Makeup Your Mind and she said she found they performed better without a lip primer, and I agree. For some reason, they go on extremely patchy and sometimes sheer with a primer, but perfectly fine without. So maybe keep that in mind when applying them. *Products were sent to me for review purposes, all views and opinions are my own.